Good morning, Saloners! It's 9.05 here and I'm 'lounging' at my desk with my tall cup of tea. We are expecting wet weather today, and after two days of beautiful sunshine, it doesn't feel good to welcome it. On the other hand, it is a good day to stay in, in my PJs, and do something fun. In another hour, I will be leaving to pick the husband up at the airport. He has been away for a week to attend a training in Dallas. Which should mean a lot of reading and knitting time for me. But it was also an insanely busy week at work, so by the time I got home, all I wanted to do was have a drink (tea is my beverage of choice) and watch some feel-good romantic comedies. I skipped all my shows as well this week, so that the husband and I can watch them together, while he we cooked. I watched a total of 10 movies this week, which is a huge number because I really don't dig television or movies. The husband is the clicker and I follow whatever he watches while I did something funner on the side. I must have gotten very used to the din of the TV because the house was way too silent this past week. Since Netflix didn't have any Meg Ryan movies, I had to make do with whatever else they had. 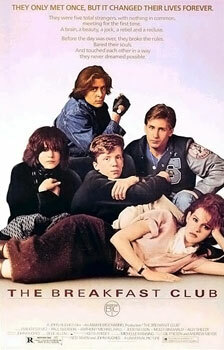 The movie I was most surprised with was The Breakfast Club. Now, I had never watched this movie, never heard of it until a few years ago. (Not all American classics make a name in India.) And I don't really dig classic movies much, but I loved this one - so timeless, I think. There were a few others too which I enjoyed (What to Expect when you're Expecting, Something's Gotta Give, Runaway Bride, The Switch), couple of which I was watching for the second or third time, and a few I did not. Today, I have some grocery shopping to do and some items to buy for the guest bedroom. I have been knitting a shrug this weekend, which I didn't think of until recently. I love shrugs and am almost always likely to be found in one. The one I'm making would be for cold evenings or an autumn day, but I'm looking forward to seeing it finished. What is happening at your end? The Breakfast Club really is timeless. The styles may be different but there will always be kids that fit those stereotypes. And I love the message that if we only spent time together to really get to know each other, we'd find we aren't all that different. So glad you were finally able to watch The Breakfast Club (and that it holds up!). I adore that movie, too. I know you'll be glad to see your husband again! It's been years since I saw The Breakfast Club but we loved it when we did. The Breakfast Club - Oh that brings back memories of going to the movies with my best friends to watch that! Hope you'll show us pics of your finished shrug! Delighted you enjoyed The Breakfast Club! I need to rewatch that film, it's been way too long. Last I checked, there was quite a bit of Meg Ryan on Netflix, You've Got Mail and Sleepless in Seattle and When Harry Met Sally. I LOVE The Breakfast Club and if you liked that, then you'd enjoy Pretty in Pink and Sixteen Candles too. I LOVE TBC!!!!!! I never tire of rewatching it too. I love that you took you're time alone and had fun with it. Did you see my review for Love Like the Movies? It immediately came to mind when you mentioned sitting around watching awesome old movies. The message of the movie was beautiful! When I read the synopsis of the book, I was really skeptical - it sounded unrealistic to me. But the movie totally blew my mind away! Forgot them as soon as I watched them, lol! I remember watching a few minutes of a few of them and skipping them, and watching a lot more than that sometimes. Which is a pity, because I believe some of them had good ratings. It was definitely worth watching! I know I will be watching it again - it is a memorable movie. I hope you do! I know I will be rewatching it sometime soon. I hope I don't run out of yarn by the time I am finished. I thought I had it properly measured. I will definitely post a photo once done! It definitely was the highlight of my day. None of those movies are on streaming now, which is a bummer, because I remember watching them on Netflix a few years ago. Either I watched on Netflix DVD or they were part of streaming at one point and then got removed. I did see your review of Love Like the Movies! I have to get hold of that book. It bugs me how they put stuff up and then take it down. Once it's up, it should stay up. How do they expect us to plan our movie viewing this way? LOL.